Looking for some creative, geeky gifts for the holiday season? Perhaps looking for that perfect gift that gives back? Or maybe you are participating in #GivingTuesday and want to do a little charitable giving? 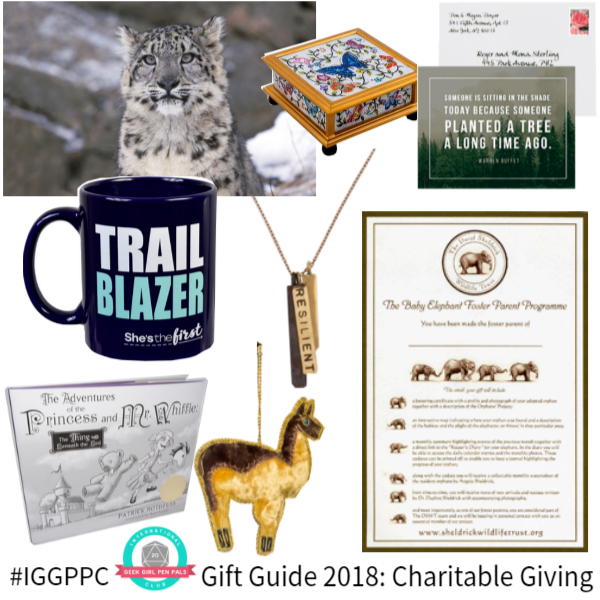 Here’s a round up of some fun things to gift your friends while also supporting some good causes! Support emerging entrepreneurs. Kiva is a neat nonprofit where people around the world contribute micro-loans in the amount of $25 to small businesses in need of a boost. It builds local economies and helps people move out of poverty through their own means. And you can gift the items made for the holiday! Each item’s page tells you who the artist is. I loved this decorative box, but there are a ton of beautiful handmade items that are sure to fit any budget and interest. Plus you’re directly supporting small business owners and artists around the world! Support forest conservation. There are all kinds of plant-a-tree organizations out there, but I like that One Tree Planted has items like these notecards that you can wrap up and give as gifts. A tree is planted for every item purchased, and they work all over the world rebuilding forests, not just in a small local area. Support women’s education. She’s the First is an organization that emphasizes girls’ and women’s education around the world. Educating women is game-changing no matter how you slice it, and this organization’s goal is equality worldwide. They’ve also got gear that makes great gifts, including this Trailblazer mug for the inspiring person in your life. Support fair trade art. Ten Thousand Villages is an organization that works with local artists from all over the world to provide a marketplace for fair trade sales– they pay the artisans a living wage for what they produce. I particularly love this Resilient necklace, but there are so many lovely things in their shop! Support elephant conservation. I know I already included an animal conservation site in this list, but there are also a ton of individual organizations doing so much to help wildlife. I love the elephant fostering program from DSWT in particular. Not only do you get to choose which elephant you want to sponsor for the year, but they send updates about that specific individual throughout the year-long sponsorship. It’s supporting an on-the-grounds organization directly, which is always cool. Support a geeky good cause. I’m not going to lie– I adore this book. I would give it as a gift regardless. But the fact that you can get a signed copy of The Thing Beneath the Bed AND that the proceeds to go Worldbuilders? DOUBLE BONUS. Worldbuilders is a nonprofit begun by author Patrick Rothfuss but blooming into a massive fundraising project within the geek community, and supports a variety of charity work around the world. Support ending worldwide hunger. This darling llama ornament is not only hand-embroidered and perfect for the crafter in your life, but sales go to support Heifer International, a nonprofit working to end hunger worldwide. They provide the means for self-sustaining food to families and individuals in the form of flocks of chickens, goats, cows, and so on, so that they can not only feed themselves but build businesses that lift up their entire communities. This is by no means an exhaustive list. Got any other charitable giving suggestions we missed? Leave them in comments!